Panchgani derives its name from the five hills around it. Panchgani is the quintessential hill station, with the Raj stamped indelibly all over it. 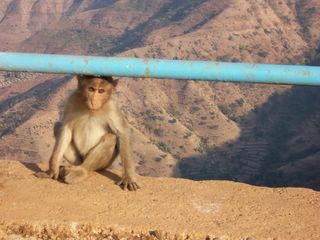 Mahabaleshwar is situated 1372 ft above sea level, was founded in 1828 and is the highest point in the Western Ghats. It is famous for Mapro.In Panchgani there are so many old British buildings and Parsi houses though the most famous are the educational institutes. There are as many as twenty boarding schools in Panchgani. Near by Panchgani / Sight Seeing:-Sydney Point, Table Land, Parsi Point, Dhom Dam, Rajapuri Caves, Devils Kitchen, Hunter point (Pratapgad Fort), Wilson Point (spectacular view of the twin peaks of Makrandgad), Malcolm Point, Kate's Point, Marjorie Point, Venna Lake, Mahableshwar Temple, Lingmala Falls, Panchganga Mandir, Tapola. How to reach Panchgani:- 98km from Pune station and Mumbai from 258 km by road.